Focal enters high-end DAC market with Arche | What Hi-Fi? 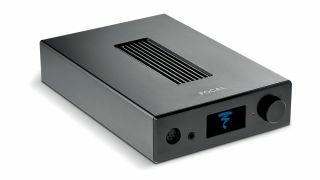 Arguably just as – if not more – exciting than Focal's all-new Stellia headphones is the news that the French brand is breaking into the DAC/headphone amplifier market with the launch of the $2500/£2499 Arche. It seems a natural next foray for a high-end headphone purveyor, although we can only wish it well in a product and price market that’s benchmarked by very high standards. Watch out, Chord Hugo 2? Focal isn’t quite going it alone, however - the Arche has been designed and manufactured for Focal by French electronics brand Micromega. The DAC/headphone amp features balanced AK 4490 digital-to-analogue converters and pure Class A amplification, with each channel driven by its own power supply. There are two amplifier modes to choose from: ‘Voltage’ (which provides an output impedance of just 0.1 ohms) and ‘Hybrid’ (which has a higher output impedance). The Arche embodies a dual mono construction to separate signal processing from amplification and thus limit crosstalk, too. The DACs support PCM signals up to 384kHz, as well as DSD256. Good news for Focal headphone owners: the Arche also has presets for each pair of Focal headphones, with future firmware updates promised for every forthcoming Focal headphone launch. The DAC feeds three digital inputs (USB, optical and coaxial), and also on the back panel is a RCA connection. The Arche can also be used solely as a DAC with an external power amplifier thanks to an XLR balanced output and two RCA outputs. Eyes towards the Arche’s front will spy 6.35mm unbalanced and balanced 4-point XLR sockets, allowing two pairs of headphones to be connected at once. The output level can also be optimized in relation to the impedance of the headphones connected. The Focal Arche will be available next month for $2500.